The new Convertible sauna tent and Hot Yoga Exercise sauna tent are available now! On July 3, 2018, the US Utility Patent was granted for the Portable Radiant Exercise and Sauna Tent, that sports two unique designs. Constructed with a thicker and 95% heat retaining radiant material, the new Sauna Fix indoor sauna tents are taller, longer, stronger, fire safe, more energy efficient than ever and incredibly multi-functional. 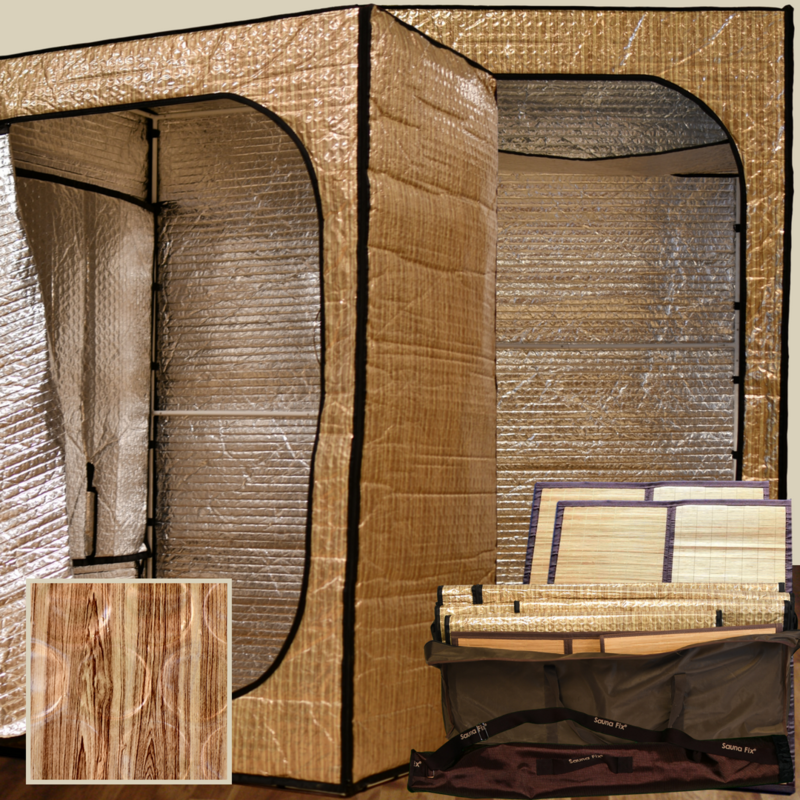 Created for use with a near infrared sauna lamp, such as the recently upgraded Sauna Fix NIR sauna lamp (sold separately), the exterior panels of the patented Convertible and Hot Yoga sauna tents now sport an attractive golden wood grain pattern design with 100% organic dark brown cotton trim. The panels are made out of five different layers: nontoxic wood grain film, space blanket, large diameter bubble wrap, space blanket, and nontoxic film. Each sauna tent can be quickly assembled and adjusted for use in a standing, sitting, or lying down sauna position while retaining heat and optimizing healing near infrared light therapy better than cotton or canvas sauna tent types. All radiant sauna tent panels and tent frame poles are specially treated and constructed so that none of the tent materials release harmful chemicals or irritating smells inside. All 2018 radiant sauna tents also include organic bamboo floor mats with radiant backing and two portable travel/storage bags for easy storing or transporting of the tent poles, panels, and mats. To save hundreds, get the sauna tent of your choice PLUS the Sauna Fix lamp and other complementary sauna therapy accessories with one of the new Sauna Fix Ultimate Bundles.